If you are a longtime reader of this site, then you know that I'm a big fan of the Warner Archive Collection, a series of films for which Warner Home Video manufactures DVDs strictly when ordered by the consumer. These movies usually don't have sufficient demand to be successful as a mass market DVD. But by going the MOD route, Warner can still provide cult audiences with a favorite film at a nominal price. You can read more about them in my previous post. One telefilm that interested me—from my standpoint as a Star Trek fan—was Gene Roddenberry's first attempt at a follow-up to his hit series, Genesis II (1973). The story follows Dylan Hunt (Alex Cord), a 20th-century scientist who ends up 154 years in the future, in a post-apocalyptic society where the world has reverted back to a form of tribalism. His rescuers, a group known as PAX, are in a sort of cold war with a group of superhuman mutants known as the Tyranians. 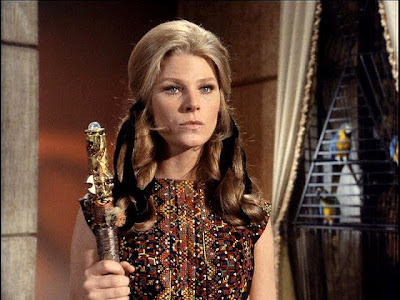 But an undercover Tyranian agent, Lyra-a (Mariette Hartley) hopes to convince Hunt to contribute his knowledge of physics—a lost science—to the Tyranians so they can fix their nuclear reactor. Which side does Hunt trust? What's endearing to any science fiction fan who grew up in the seventies is the shabby-chic production design of the show. As with most post-apocalyptic adventures (I'm thinking Silent Running, Logan's Run), grunge is the order of the day. But the cinematography by the wonderful Jerry Finnerman (Star Trek), and the silly little touches (How can you tell Hartley is a mutant? She's got two navels), and extended cameos by the likes of Ted Cassidy (The Addams Family) make this a real fun watch. And it is directed by John Llewellyn Moxey (The Night Stalker), a TV director who has gotten some recent attention elsewhere in the blogosphere. This pilot failed to attract enough viewers. Roddenberry reworked the series concept for a second pilot, Planet Earth (1974) (also available from Warner Archive), with John Saxon replacing Cord in the part of Hunt. But again, low ratings. A year later, a third attempt was made by producers to revise the concept, this time without Roddenberry's support but still with Saxon's involvement, and it failed again. The irony is that even a failed show, at that time, got higher ratings than any successful ones do today, due to how audiences have splintered since the advent of cable. Another cult favorite I watched is Don't Be Afraid of the Dark (1973), directed by John Newland host of the paranormal One Step Beyond (1959-61). This one is by turns laughably silly and horrifyingly frightening. Kim Darby (True Grit) plays a woman whose marriage becomes strained over her belief that tiny demons haunt their new house, demons which she may have let out after tearing down the boarded up fireplace in the basement. William Demarest gets his chance to show his rusty dramatic chops after years of playing Uncle Charley on TV's My Three Sons. And though some of the chauvinism and colorful acting can be jarring now, it is reminiscent of some of the creepier episodes of Rod Serling's Night Gallery. 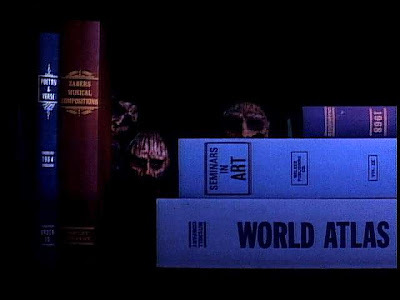 Other notable telefilms in the Warner Archive Collection include Bad Ronald, City Beneath the Sea, Death of a Centerfold: The Dorothy Stratten Story, The Deliberate Stranger, Earth II (1971), The Man From Atlantis, and The Stranger Within.